Before the Fitbit Ionic, there was the Fitbit Blaze. The smartwatch that Fitbit claims isn't a smartwatch, despite James Park telling us it was Amazon's best selling smartwatch and it even features in the 'smart watch' category on its website. You're not fooling us Fitbit and there's probably fair few of you wondering whether you can save splashing out $300 on Fitbit's latest wearable and pick up a Blaze instead. After all, the Blaze is significantly cheaper, does offer notification support and will also serve up many of the fitness tracking features included on the Ionic. So where are the compromises and what will you have to live without if you go for the Blaze instead of the Ionic? We've done the hard work and compared the two to help you out. Got any questions about how the two Fitbits match up? Let us know in the comments section below. The Blaze and the Ionic are not the prettiest wearables you'll ever come across. We know designs are subjective, but if you are hoping for either of these to draw glances in the same way that a beautifully crafted watch does, then be prepared to be disappointed. Both feature, blocky, rectangular bodies and sporty straps that are reminiscent of those early Android Wear smartwatches we saw from Samsung and LG. The screens are near identical in size, but the Ionic has the brighter of the two by a considerable distance. The Ionic features a unibody, waterproof design while the Blaze's screen pops out of a frame that can be replaced to mix up styles. We should mention that the Ionic will soon be available in a special Adidas edition, which does bring some minor changes in the design department. Straps on both are interchangeable as well, but it'll cost for those additional bands, so that's worth keeping in mind when you're picking one out. As far as wearing day to day and during the night, they offer similar levels of comfort and we have no skin irritation issues to report either. The Ionic does look only slightly larger on the wrist, but ultimately there's not a lot to pick to between the two. These are two very techy-looking, sporty smartwatches that are very much in line with the design language of Fitbit's other trackers. This is what Fitbit does best and whichever option you go for, you're not going to feel shortchanged. Fitbit has done its best to roll out the same fitness tracking features across all of its devices and there's nothing to separate these two trackers. You can track steps, distance, calories burned, floors climbed and heart rate 24/7. There's also inactivity alarms to keep you moving and guided breathing features to help you relax during the day. All of Fitbit's latest sleep tracking features are included including the new Sleep stages to help gain a better understanding of sleep quality. While you might have to make compromises elsewhere, fitness tracking is one area you most definitely will not have to. If you care more about counting steps and logging sleep, both the Blaze and the Ionic do pretty good impressions of sports watches too. Fitbit's SmartTrack automatic exercise recognition tech is available on both watches, but when it comes to dedicated tracking modes, that's where things start to separate. The Blaze doesn't have GPS but does have the ability to track running and cycling session piggybacking off your phone's GPS to map routes. It also offers modes for things like weight training but the data captured is far more basic than when you're recording a run or a ride. The Ionic has GPS built-in letting you track running and cycling sessions sans smartphone. It also tracks swimming as well and has additional tracking modes, which again serves up more basic data like workout duration and heart rate. Speaking of HR, there's Fitbit's PurePulse heart rate sensor on board both the Blaze and the Ionic to measure workout intensity and for if you want to dabble in some heart rate zone training. In terms of accuracy and performance, both do a pretty solid job, but we do still have some reservations on both fronts when it comes to taking readings for short bursts of high intensity training. It's a criticism we can level at a lot of wrist based sensors and thankfully Fitbit's is not the worst performer we've come across. Onscreen workouts were a newcomer on the Blaze, simply because it was the first Fitbit to house a screen big enough to walk through exercise routines. The FitStar-powered feature is also on the Ionic but has been rebranded as Coach, Fitbit's new personalised training platform. The idea is largely the same, but with the Ionic you'll also get recommendations, suggestions and programs to guide you to make health and fitness improvements. There's a few workouts thrown in to start but a subscription service is required to get all of the extras. Putting aside the fact that Fitbit doesn't refer to the Blaze as a smartwatch, it's easy to see why it is mistaken for one because it offers some of the features you'll find on an Apple, Google or Samsung smartwatch. Like the Ionic, it's compatible with Android, iOS and Windows phones, but smartphone notifications for first and third party apps will only work on iPhones and Androids. The only other notable smartwatch-esque feature is the ability to control music playing on your phone. That's your lot. On the Ionic you get a similar approach to notifications, which is limited to seeing them on the watch screen and being able to dismiss them. But you do also get Fitbit Pay for contactless payments, the ability to store music with offline playback via Pandora (US only) and Deezer for the rest of the world with support landing in 2018. You also have the ability to download apps, albeit there's not a lot of those right now, but the big names are slowly coming through. You can also switch up watch faces and even create your own if you don't mind delving into some developer coding. 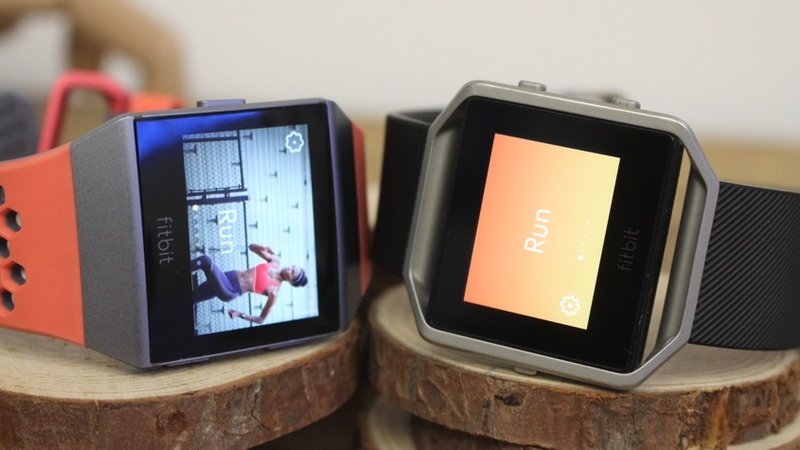 Bottom line, for a more complete smartwatch experience, go for the Ionic. We'll start with battery life first because most will think that opting for the Ionic will mean sacrificing some stamina. That's actually not the case and both the Blaze and the Ionic can offer up to 5 days of battery life. We've found that to be accurate in our time with the two Fitbits, even without scrimping on the use of their core tracking features. There's also that super bright screen on the Ionic we were almost certain would drain the life out of the Ionic. As far as charging is concerned, they'll both take one or two hours to go from 0% to 100%. You will also have to contend with proprietary chargers as well, though the Blaze is arguably the more ridiculous of the two with its small, boxy cradle frame compared to the Ionic's cable, which plugs into the back of the watch. Pricing is inevitably going to be a big factor for a lot of people. The Blaze is priced at $199.95, and if you shop around you're almost certain to get it for cheaper than that. The Ionic is considerably more expensive at $299.95. If you want to buy the optional straps then you can spend up to $60 for the more luxurious options. With the Blaze, you also have the option to mix up both the frame and the straps with the priciest option costing $129.95. This decision really centres around what you want from your Fitbit watch. There's not really a lot to choose between as far as design is concerned. The Ionic essentially apes the Blaze's look albeit with a vastly more impressive screen, and is waterproof to offer swim tracking. So if you care about swimming, then the Ionic is the one for you. Fitness tracking features are identical and both offer mapping for running and cycling, but it's the Ionic that has onboard GPS so you can do it without your phone nearby. As smartwatches go, the Ionic is the clear choice. Both offer similarly basic approaches to smartphone notifications, but the Ionic has the added bonus of Fitbit Pay support for contactless payments, an app store and the ability to store music for a more untethered experience. If you can live without some of the smarter features and fitness tracking from a watch-like wearable is the priority, though, then there's definitely a strong argument to go Blaze over Ionic and save some money in the process. What a thorough & clear comparison provided for us! Thank you!